This works as expected. Happy with purchase. I had to purchase this particular pop up due to one not being included with my faucet. Due to the fact that I wanted the overflow option to ensure that I did not have overflows of sinks with a faucet left running, I found that this unit is one of the few pop ups that offers this feature. The fixture is both functional and beautiful. The ORB finish matches that of the faucet. No issues here! Great look but couldn't get it to stop leaking after the water was turned off. Tried about 6 times, installing and re-installing. Had a friend come over who is a licensed plumber and concluded that it was thesmaller washer. After replacing them leakage stopped! 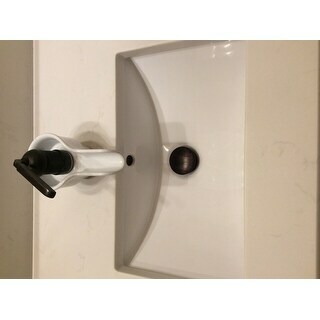 oil rubbed bronze matches perfectly to the faucet I ordered. Very functional and easy to use and install. First time to have a pop-up drain. This one is easy to install beautiful and I love this pop-up drain! Cool New Style of Overflow, Just Press! This matched my new copper sink perfectly. I am very pleased with the quality. One of those items you have to have but don't care much about except it matches the sink and faucet. Heavy. Well made. Very beautiful and easy to install the finish is very nice and the quality of the materials are very good, the price is fairly cheap, totally recommend this piece. Looks nice, works well. Difficult to install. The size of the extension was not a standard drain size. Bought this to go with the faucet set purchased on Overstock. Same band. Goes perfect with it. Not much else to say about a drain. Nice product, properly made. Great buy. Complimented our choice with the faucet. The copper pealed off the sink part of the drain and the stopper broke off both units I purchased. I glued one back on and it's staying but in the more frequently used sink the plunger top keeps coming off. Very unhappy! "I have thick granite and a large vessel sink requiring 3.25" minimum from top to the threading to be able to secure the nut. I did not see an indication of the size of the threaded portion in the specs. I have tried two drains already and both were too short on the threading." Hello renovator99, this is compression threaded and will fit a drain that is 1.5 inches in size. Thanks for shopping with us! Better match with copper sink. "we bought a copper vessel sink form Overstock and the item that was recommended to buy with this sink does not fit - it is too big to go thru the opening in the sink. the plumber said that i needed one about 11/4" in size. will this fit?" Thank you for contacting us sdiver41. You will be contacted by Customer Care. Hello overstockpad1,Yes, the package includes mounting instructions.Thanks for shopping with us! "Is the mounting ring also oil rubbed bronze?" Hello, niinatais. Hope your day is going well. Yes, this drain only comes in an Oil Rubbed Bronze finish. The mounting nut for this drain is also in the dark ORB finish. Thank you for shopping with us and please feel free to contact us again with any further questions. "Does this item come with the mounting ring?"